Keep your eyes on all stages of your modules in SuiteCRM using Kanban! What is a Kanban Board and how it works with CRM? How it works with CRM? Kanban boards map and visualize your work into an organized flow that allows you to view your efficiency, productivity, and management of the work. CRM is an important tool in many businesses because it gives users a glimpse into their customer data. 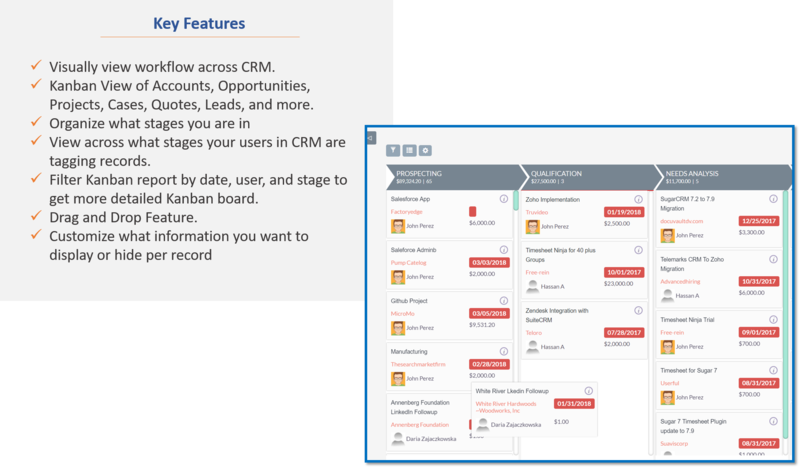 User's in CRM can use this data to track projects, supports their customers, and optimize their selling capability to their customers. However, a Kanban board can take that data in CRM and break it down into stages visually to users. This will optimize the way users manage their flow across modules such as Opportunities, Quotes, Leads, Projects and more.